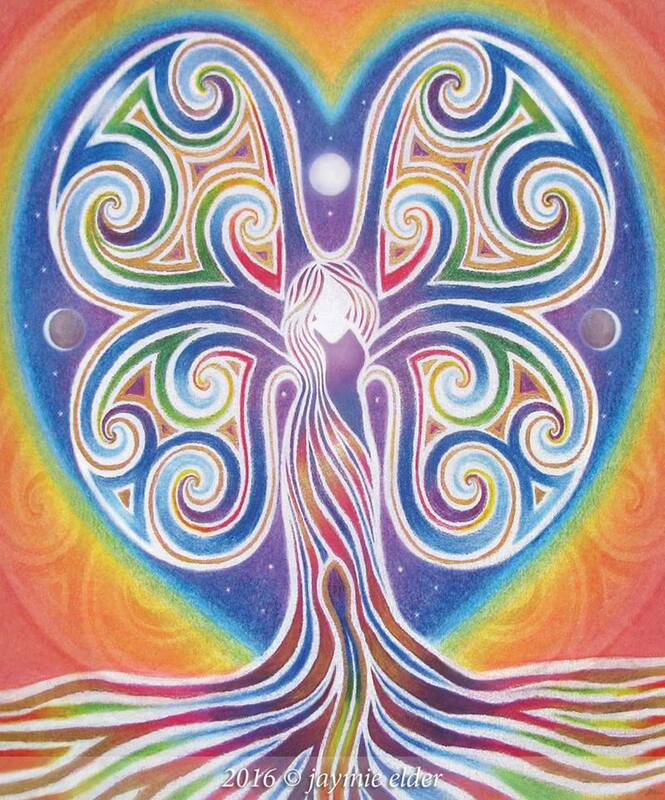 The Rainbowtree Woman is about balance and harmony between the Spirit world and Mother Earth. She represents a deep connection with the intuitive wisdom of our soul. The Rainbowtree Woman is my soul guide and guardian angel. I connect with her for inspiration, soul wisdom and strength. She supports my own ongoing transformation as well as my work with men and women to heal, grow and embrace the Sacred Feminine in our heart, body and all of life. I was guided to paint the Rainbowtree Woman about 11 years ago as part of my own personal healing journey. The Rainbowtree Woman Mandala eventually grew into a series of cards depicting my own nature photographs and animal paintings. “Rainbowtree Woman is a messenger for Spirit and Mother Earth. Sacred Feminine in nature, our heart, body and life. of intuitive messages, feelings, visions and dreams. I am a soul journey guide and artist, creating and sharing through my paintings, photographs and writing. I have a background in graphic design, counselling and combining work with children, nature and the arts. I have been dedicated and committed to walking my own healing, creative soul path since early 2001. I have a strong heart and soul connection with Mother Earth. I love to inspire and encourage people to connect with the magic and beauty of nature, through my paintings, creative writing and photographs. Rainbowtree Woman Cards created for the use in sessions with clients. What is “Soul Work” & why do you call yourself a “Soul Journey Guide”? I believe the greatest gift we have to give the world, is that of our own self-transformation. This involves not “eliminating” the dark by only focusing on “the light”… *in truth, this does not work*… but transforming the dark/shadow within ourselves, through awareness, forgiveness, compassion and love. For me, the term “soul work” seems to fit this process of many cycles – or spirals 🙂 – we move in and out of, on our spiritual journey. Soul work is an ongoing, transformative, unglamorous and often very difficult process of working with the core truth in ourselves, our relationships, our life and the world. It is bringing awareness (light) to our wounded (shadow) parts of self. If we remain open, humble and heart centred – the awakening process we each move through will help us to relinquish our masks (protection) and journey deeper into our core wounds of this lifetime and others. Just like the seed that waits in the darkness of the earth, within our core wounds lies the potential for transformation, healing and new growth. By transforming our core wounds/shadow with love, conscious awareness and compassion, we discover a deeper sense of love and authenticity in who we are. We become more open to recognise the true purpose of our journey. over self-limiting beliefs, stagnation and what is “known” to us. waiting to be transformed through love, compassion and wisdom. For any further questions, please contact Jaymie.